Floods and flash floods happen in all 50 states and at any time of year; however, most insurance policies do not cover flood damage. Flood is considered any surface water entering the home. This can be rising up through your drains when storm drains are overflowing, coming in through cracks in the foundation, or even pouring in through a basement window well. Approximately, 25% of all flood insurance claims occur in low to moderate risk areas. We have a couple options for providing flood insurance. The standard policy is through the National Flood Insurance Program (NFIP). With this program, flood coverage does not become effective until 30 days after its purchase, so it is important to buy the insurance before the flood waters start to rise. Primary flood coverage is available up to $250,000 for dwelling coverage. Additional coverage may also be available. For our Safeco clients, they have recently released a flood endorsement that can be added to existing or new home insurance policies for those in low or medium risk areas. This endorsement can be as low as $75 a year. We would be happy to quote coverage for you. Please contact us if you are interested. You should know exactly where you can find important documents such as your insurance policy, agency contact information, finance records, and receipts of major purchases. Furthermore, you should continually be updating your household inventory with pictures and videos as you make new purchases. Don’t forget about the things stored in your basement, attic, and garage because those are the most likely to get damaged. This inventory will prove to be very helpful if you ever need to file a claim. Most importantly, clear leaves and other debris from your gutters and downspouts. Also, make sure that the electrical components on the side of your house (switches, sockets, circuit breakers, wiring) and large appliances (furnace water, heater, washer, and dryer) are all at least 12 inches above your home’s projected flood elevation. If you are lucky enough to have a sump pump, test that it is still functioning properly and install a battery-operated backup in case of failure. You may want to consider installing a water alarm to let you know if water is in fact accumulating in your basement. Drinking water, canned food, first aid kit, blankets, a radio, and a flashlight should all be easily accessible in your home in case of any emergency, not just a flood. Teach your children how to dial 911 and where in the home they should go for different types of storms (tornado, flood, etc). Also, discuss a plan for how to protect your pets in the case of an emergency, they’re part of the family too! By taking these few steps now, you may save yourself a whole lot of heartache and headaches in the future. 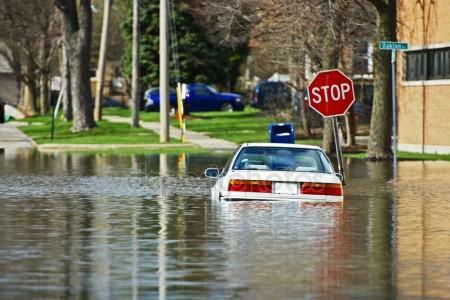 As always, if you do fall victim to water’s wrath, know that we are here to help you!